Already over 40 years ago, historical vehicles dating from the beginnings of Saxon narrow gauge railways started to be preserved. This was the basis for the creation of the still popular Radebeul traditional train. All special excursions on the charming Lößnitzgrundbahn railway will take you to attractive tourist destinations. Trains run past the vinyards in Radebeul, through the wild romantic Lößnitzgrund valley to Moritzburg with the world-famous baroque castle - August the Strong's pleasure palace and hunting lodge - or to the final stop in Radeburg, the birth place of Heinrich Zille. Before you start your journey into the past of Saxon narrow gauge railways on the traditional train or take a ride on one of the steam trains running daily, we recommend you visit the museum train in the open space of Radebeul Ost station. This train is preserved and maintained by the "Radebeuler Traditionsbahner" (association of traditional railwaymen). Highlights among the numerous special excursions on the steam-driven traditional train include the carnival parades in Radeburg, the annually recurring Karl May festival or fishing dry the ponds in Moritzburg. 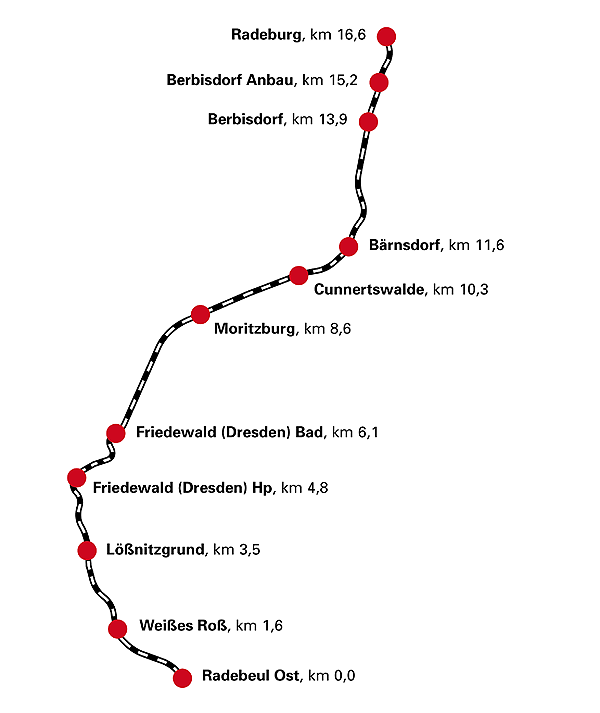 The Tradiditionsbahn Radebeul runs on selected dates.